No portrait can capture a life, just as no history or memoir is complete. All are representations, depictions of persons, places, and events that are forever lost to time. The word “represent” captures the futility of this enterprise itself. “Re-present” is to make something or someone present once again. But no human creation is capable of such a task. A photograph of my parents is not the same as my parents. It’s two-dimensional; it cannot speak, breath, or live. Likewise, the film of Zina’s and my wedding day, captures only the shadow of who we were and of our friends and relatives. But those people are all changed—aged and balder and fatter, in my case—and many of them are dead. It’s impossible for us to conjure them back. That is why, I believe, God gave us four separate gospels. Each tells the story of Jesus for a different audience and with different details and between them all we arrive at a more complex, more three-dimensional vision of who He was. Mark gives us the details of his life, Matthew and Luke add his words, and John expands His words and deeds into a complex theology. Mark tells the story of Christ for an audience who were exiled from their homeland, who spoke Greek rather than Aramaic, and who knew little of Jewish customs. Matthew speaks to an audience of Jewish Christians, setting his narrative solidly within Jewish traditions. Luke, on the other hand, is written to gentile Christians. He often gets Jewish traditions wrong. But both Matthew and Luke call their audiences to embrace Jews and gentiles alike. While Jesus’s words are short and pithy in the other gospels, John’s Jesus speaks in long monologues, and of dualities of light and darkness, knowing and unknowing, heaven and earth. I find comfort in the differences found in the four gospels—between the four we glimpse different visions of Christ, of who he was and what he meant in the lives of His followers. The Book of Mormon expands our vision even further, with a Christ who cares and ministers to all his people. I know an artist who dislikes seeing artistic representations of Christ outside of the scriptures. He feels, somehow, that it fixes his vision in ways that may deter true worship. Me, I’m just the opposite. I love seeing different representations of Christ, from antiquity to the present, from high art to the folksiest kitsch. Seeing others’ depictions of Christ helps me imagine the Jesus I cannot fully comprehend. One of the most unique depictions of Christ I’ve seen was also while we lived in Maryland. 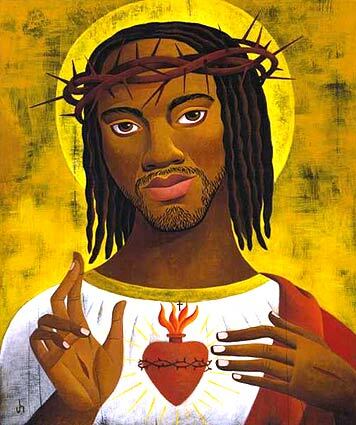 Once when we were shopping at a mall, we saw a store that was selling a portrait of a black Jesus. At first I was a bit shocked. Didn’t they know Jesus was white? But then I realized that Jesus wasn’t white. Coming from the Middle East, Jesus’ skin was no doubt darker than the Nordic-style images I’d grown up with. And certainly, Jesus loves all of us. As the Book of Mormon tells us, Christ “inviteth … all to come unto him and partake of his goodness; and he denieth none that come unto him, black and white, bond and free, male and female; and he remembereth the heathen; and all are alike unto God, both Jew and Gentile” (2 Ne. 26:33). There is an old saying that “you can tell a lot about a person by the company he keeps.” If that’s true, what does it suggest about the way Christ is portrayed in the Gospels? Jesus befriended the commoner; associated with lepers and sinners; ate and drank with the despised and outcast. He even defied cultural assumptions to affirm the dignity of women. While not allowed to give testimony in a Jewish court, women served as the first witnesses of the resurrection. Christ reversed the social order of humans, “So the last shall be first, and the first last,” as Jesus says in Matthew (20:16). Another depiction of Jesus that has greatly enriched my life is one that I discovered just last summer in a small Catholic chapel in New Mexico, the Sanctuary of Chimayo. I was on a road trip to a conference in Texas, when a friend and I decided to stop at the little church. I have always suffered with depression and that summer I was seeking a new way of seeing the world. As I sat meditating in the small chapel, I felt I received an answer to prayer: that I should open myself up to joy, that I should try to be more conscious of the happiness in my life. As I stood up to leave, I noticed a small image on the wall right next to where I had been sitting. 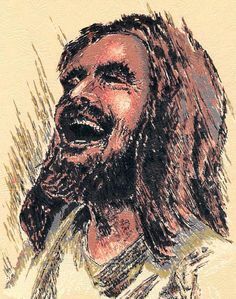 It was an image of Jesus laughing. It gives me a deep sense of joy to think of my savior as someone with a sense of humor, as someone who knew how to laugh and enjoy himself. Some friends of mine wrote a book called “The God Who Weeps,” discussing the ways God sympathizes with his children. And I love the thought that our God and Savior weep for our misfortunes. But I love to worship the God who laughs, the Christ who sees the foibles of humanity with an eye of charity, love, and humor. I think the language of the King James Bible, as beautiful as it is, sometimes gets in the way of our understanding just how witty Jesus was. He reveled in hyperbole, paradox, and metaphor. “You worry about a sliver in your neighbor’s eye, when you’ve got a log in your own!” or “If you really want to find your life, you’ve got to lose it.” He referred to his disciples with pet names, calling Simon, “Peter” which means “pebble”; and referring to James and John as the “Thunder-boys.” He frequented parties and weddings, where people would dance and sing. Seeking for Christ in the words of the Gospels and the Book of Mormon as well as in art and music has helped me come to understand a Christ I can no longer remember but long to see. And I hope these different visions of Christ help me to recognize him when I do see him. “For now we see through a glass, darkly,” wrote the apostle Paul to the Corinthians, “but then face to face: now I know in part; but then shall I know even as also I am known” (1 Corinthians 13:12). Whenever someone shows love or kindness or forgiveness or joy, I believe, we also get a glimpse of Christ. When Zina’s father passed away in 2005, I felt a deep sense of loss. I loved him as much as I loved my own parents. On the day of Hugh’s death, when I walked into the Nibley house where his body was lying, Hugh’s brother, Reid, one of the kindest men I’ve ever known, immediately rushed toward me and gave me the most comforting hug I’ve ever experienced. At that moment of intense loss, I also felt a sublime sense of grace and love and acceptance. I broke down and sobbed on his shoulder. I have often thought back on that moment, I have even dreamed of that moment. I believe Uncle Reid was standing in for my Savior, comforting me as He would have done. 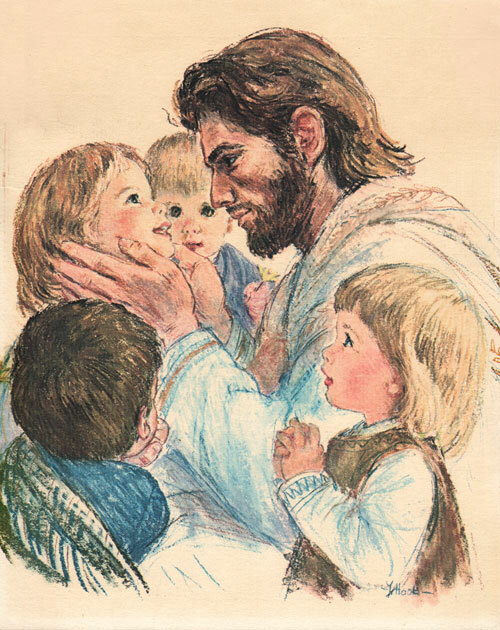 And I look forward to the time when, as Nephi puts it, “I am encircled about eternally in the arms of Christ’s love.” For I know, through the many testimonies and portrayals of him I’ve experienced, that he lives and loves, and I will see him again.